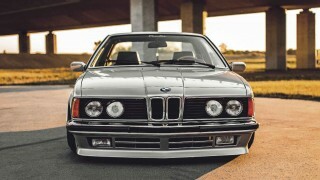 Stunning air-ride BMW E24 635CSi Before Jan-Eric Geugis bought this E24 sharknose, it had only ever had one owner. And now the CSi has lured him down into the murky swells of the deep, Jan-Eric reckons he’ll be hanging on to it for life… Words: Daniel Bevis. Photos: Henry Phull. It’s a popular Hollywood trope, thanks in large part to Spielberg, that sharks like to bite people. It’s not necessarily true; according to the International Shark Attack File (which is a real thing, an official database of shark attacks on humans), between 1958-2016 there have been 2785 confirmed incidents recorded, with 439 of those being fatal. They sound like juicy numbers, but it adds up to less than one shark attack a week across the entire globe, and fewer than eight deaths a year. Hang on, though… those might look like small numbers on paper when you divide them down, but every single one of those probably represented the worst day in their life for most of those people (certainly so for 439 of them). Given that humans and sharks don’t even dwell in comparable respiratory habitats, and sharks haven’t figured out how to come up on land to chew people, it stands to reason that these creatures are something we need to be extremely wary of. Perhaps this is why BMW looked to the Selachimorpha superorder for design inspiration in the 1970s and ’80s. These gilled lunatics are impossibly menacing, and an air of menace is a vital design element if you want your cars to have maximum rear-view mirror impact. If you see a shark swimming up behind you on the motorway, your natural reflex is to change lanes before it bites out a ripe chunk of buttock flesh, no? As a student of automation and mechatronics, it stands to reason that Jan-Eric would take a rather forensic and scientific approach to car ownership, and it also follows that he’s never been happy to leave anything stock. That 320Ci Clubsport received coilovers and E92 wheels along with a full OEM+ interior makeover, while the following E36 325i was a low-budget drifter built purely for hijinks; the current daily – an E46 330d Touring – has KW coilovers and BBS RC301s. And after all of this practice, getting his eye in, that was presumably the point at which he decided he was ready for an E24? Classic Nardi steering wheel. M635CSi E24 black leather interior has been fitted. Undoubtedly one of BMW’s most iconic designs. 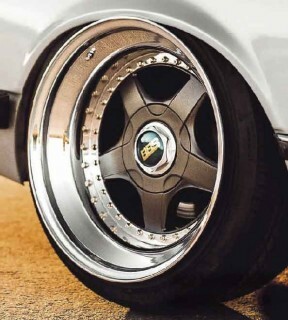 Stunning BBS RFs stepped-up to 18s. 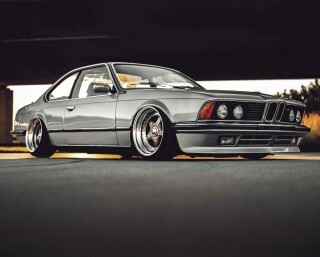 In the case of the top-of-the-range 635CSi, this is no ordinary shark. It’s not a fishy flipper-enthusiast like the mako, or a freakish clown like the hammerhead. No, this is a shark that’s figured out how to clamber out of the oceans and breathe our oxygen, made its way through business school, and is now slinking about in an impeccably-cut Savile Row suit. This shark won’t just rip your throat out, it’ll then go to your house, channel all of your assets into its Cayman Islands account, and sleep with your wife. And that’s before a headstrong mechatronics whizz-kid with a penchant for modifying BMWs gets hold of it. “I already had a plan for modifying it before I even got it home,” grins Jan-Eric. And that slight seismic ripple you just felt is the entire world simultaneously shrugging to indicate a total lack of surprise. “I’d already ordered the suspension parts and the wheels before I’d paid for the car…” No messing about then, and typically ruthless German efficiency. So did he cruise about in his artfully weathered sharknose for a while, enjoying the heady and intoxicating endorphins released by a lifelong dream fulfilled? No, he rolled it into the garage and started dismantling it. The suspension plan had to start post-haste. “I replaced the OEM suspension with custom-made air-ride struts,” Jan-Eric explains. “This was combined with Air Lift AutoPilot V2 management, and a simple but clean boot build with a 19-litre air tank. I also built up a set of BBS RF 004s, which started out as 8x17” – I stepped them up to 18” with bubble lips from slantlips.com, staggering them at 10 and 11x18”. The centres are Shadow Bronze, with polished hexes and lips and gold bolts. You see, by my reckoning you can count the wheels that’ll work on an E24 on the fingers of one hand, so you’re limited by choice; the BBS RF was the clear favourite for me because they’re a bit less obvious than the RS that most people go for. There were a few small mods required to get them to fit when the car airs out too – the arch lips were widened by my friend at Megerle Metalworks, who’s a god at working with metal; he subtly widened them just a bit to fit the broader wheels.” Seamless, isn’t it? Particularly given that Jan-Eric was keen to keep the original paint, so there could be no cracking or flaking or arch-related trauma. The finished result is something that only an enthusiast would spot, so beautifully resolved are the angles. “The styling idea was there all along, and it’s been fulfilled perfectly,” he says. “It had to be stanced, wide and fitted, the idea being to create something that’s at once elegant, and aggressive like a punch in the face.” Shark-like behaviour indeed, and it’s evident that the effect works. Indeed, the look is so spot-on that Jan-Eric’s opted not to mess with the mechanicals so far, the stock engine and transmission keeping up the good work that they’ve been doing for decades. This is no great hardship, as the BMW 635CSi’s meaty M30B34 straight-six is a unit with a lot of heart, a 3.4-litre thug throwing out in excess of 200hp in unmolested form. Even in this age of ready and swelling power, that’s a respectable number. “I wanted the interior to be sporty but elegant too,” he goes on, keen to highlight that this is a cohesive build which flows logically from outside to within. 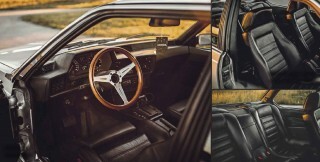 “Although it had the leather seats I wanted when I bought it, I’d realised that I’d really prefer the Sport seats from the M635CSi, so I swapped out the blue Comfort leather for a full black leather Sport interior – I was lucky enough to find one that was mostly complete, with all the fiddly little bits you need, and I spent a couple of weeks swapping it over to make sure it was done right.” These sporty new innards are complemented by a Nardi steering wheel, and again the overall effect here creates something that would look factory-standard to the casual uninformed bystander, with each of Jan-Eric’s upgrades instead appearing as Easter eggs to the seasoned observer. “The build took me about five months from start to finish, but a lot of that was just being held up by parts suppliers,” he says. 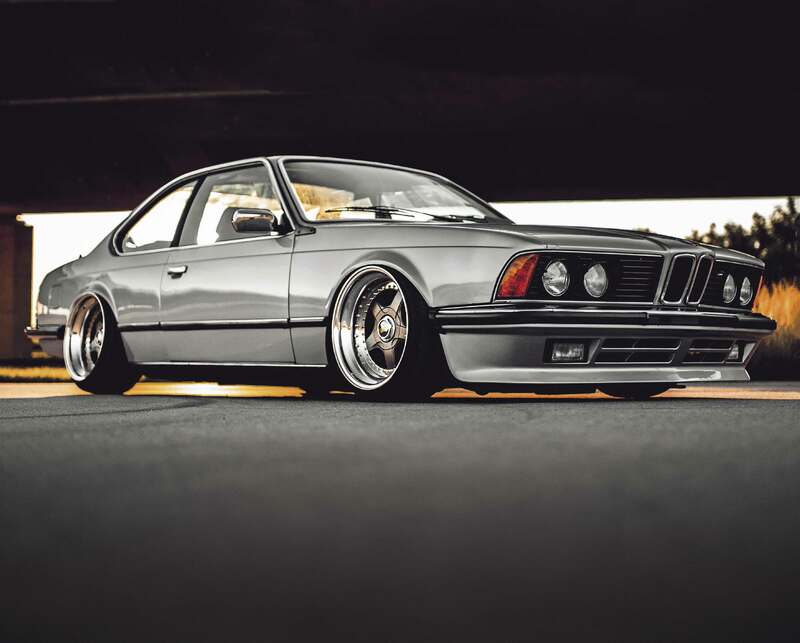 “My favourite part of the car is definitely the wheels, as I built them myself exactly how I wanted them, and they turned out perfect.” So, any future plans for the project? “Oh yes, lots of plans. If money were no object I’d swap out the engine and the trans, although that is on the cards regardless – it should either be swapped or turbocharged! And maybe I’ll change the concept a bit in next few years and make it faster, less comfy, but more fun on the street. The only problem is our German laws, whereby such mods as it has now are already legally questionable, let alone the idea of the engine swap I want for my old-timer…” But there’s plenty of time to think about the ins-and-outs of that, as Jan-Eric’s adamant that he’ll be keeping the car forever. “I have a feeling I won’t ever get bored of it,” he says. And that makes perfect sense. A pet shark is always going to keep you on your toes, isn’t it? You can love and cherish it and lavish attention upon it, but one false move and it’ll have your leg off. Never a dull moment.